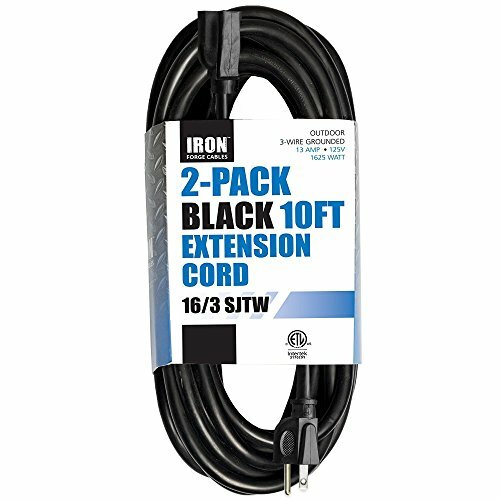 Iron Forge Cables' 2 Pack of 10 Ft Extension Cords is the perfect power cable for all your electrical needs. It offers durable strain relief for optimal performance, and a 3 prong grounded molded male plug for added safety. The cord's 10 foot length gives you great reach across your office. UL Listed. DURABLE STRAIN RELIEF for optimal performance. ALL PURPOSE EXTENSION CORD PACK for Indoor and Office use. Ideal for computers, monitors, printers, other office appliances, and home use. REINFORCED BLADES protect prongs from bending or breaking. The black cable blends into your office's decor. LIFETIME REPLACEMENT WARRANTY - Iron Forge Cable stands behind all of its extension cord packs 100%. If anything ever goes wrong with these, we will replace them with new items. If you have any questions about this product by Iron Forge Cable, contact us by completing and submitting the form below. If you are looking for a specif part number, please include it with your message.